Yellow Shirt with dark blue denim skirt; Navy Blue socks with Black leather shoes; Navy Blue ribbons(for girls with long hair) and Navy Blue hairband (Hosiery material) for all girls. Yellow Shirt with dark blue denim shorts; Dark blue socks, with black leather shoes. Black and white striped half sleeved shirt with black shirt; black socks, black leather shoes, white ribbons(for girls with long hair) and white hairband(Hosiery Material ) for all girls and black belt with School Monogram. 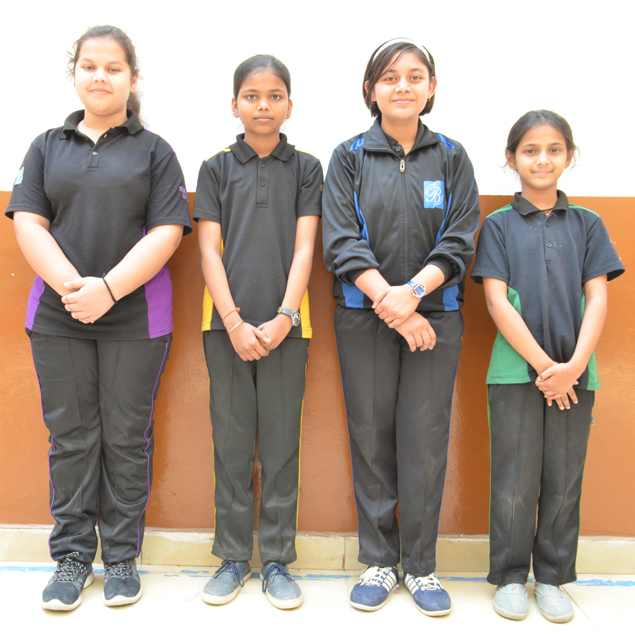 Class IX onwards girls have to wear black trousers. Black and White striped half sleeved shirt with black shorts(I TO V) and black trousers (VI onwards); black socks, black leather shoes, School tie and belt with School monogram. 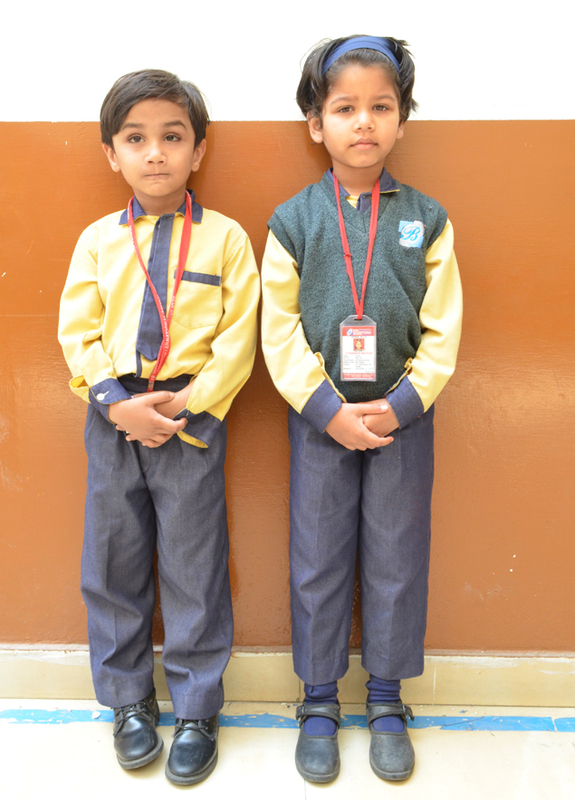 Full sleeved yellow shirt, denim trousers, dark grey without sleeves pullover with the school logo, denim shade (dark blue) coat with red lining,dark blue socks and black shoes. Full sleeved shirt with black and white stripes, black shirt, without sleeves black pullover with the school logo, grey blazer, black & white striped tie & school belt, black socks with black slacks(For class: I-II), long woollen grey socks(For classes:III-VIII) and black shoes. Class IX onwards girls have to wear black trousers. Full sleeved shirt with black and white stripes, black trousers, without sleeves black pullover with the school logo, grey blazer, black&white striped tie and school belt, black socks and black shoes. Black colour T-Shirt with House colour strip on the shoulders and sides along with name of the house written on the arms; black lower, belt with school monogram, black socks and sports shoes. 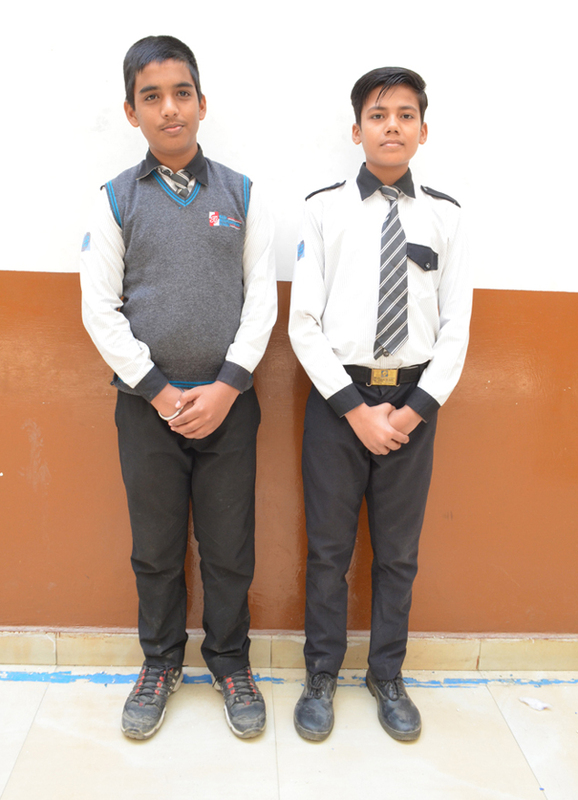 Black colour T-Shirt with House colour strip on the shoulders and sides along the name of the House written on the arms; black shorts for classes I-V and black trousers for boys of class-VI onwards, belt with school monogram, black socks and sport shoes. NOTE:HOUSE UNIFORM MUST BE WORN ON EVERY SATURDAY AND DURING COMPETITIONS ORGANIZED ON OTHER DAYS.